Download and update all brand laptop drivers and software for Windows 10, 8.1, 8, 7, Vista, XP, Linux 32 and 64 bit at LaptopDriversLib.com. If you're reinstalling Huawei MateBook E laptop, then here are Huawei MateBook E drivers for Windows 10 64 Bit you can download and install to get your notebook work correctly. 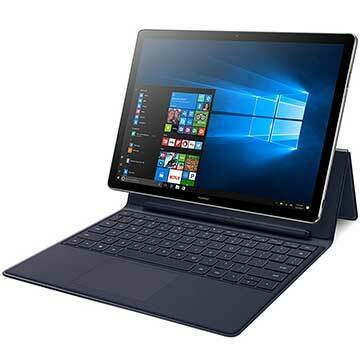 Huawei MateBook E is 12 inch 2-in-1 convertible touch-screen laptop powered by 7th Generation Intel Core m3-7Y30 processor or Intel Core i5-7Y54 processor with integrated Intel HD Graphics 615 video card. It comes with 4 GB / 8 GB LPDDR3 system memory and 128 GB / 256 GB / 512 GB SSD solid state drive to store your documents. This mobile computer features 12 IPS (2160 x 1440 pixels) 2K screen display, IEEE 802.11a/b/g/n/ac Wi-Fi, Bluetooth 4.1, Dolby Audio Premium technology, and 33.7 Wh battery with up to 9 hours battery life.